Augsburg tram 8002. This is a MAN type M8C from 1985. Photo by Erik Hjelme 23 September 1995. 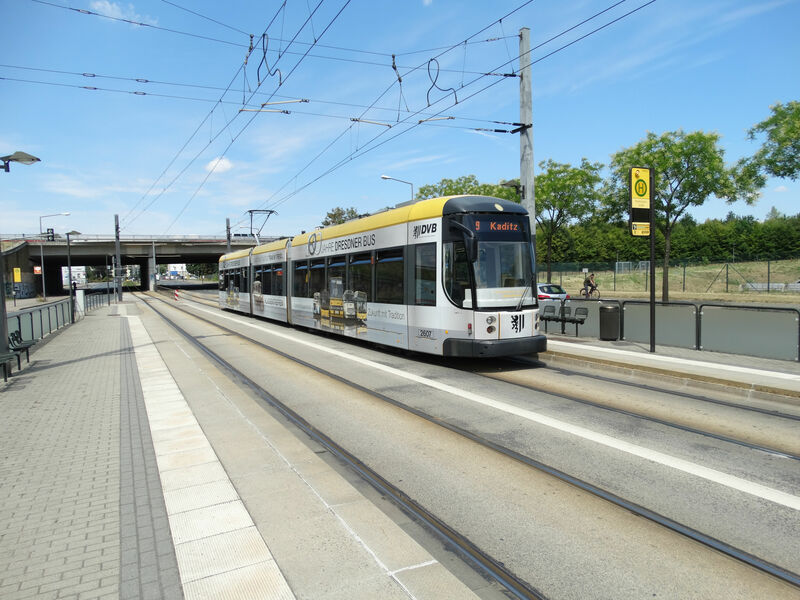 The tram type Augsburg M8c has two drivers' cabs and doors on both sides, so it doesn't need a proper turnaround loop. 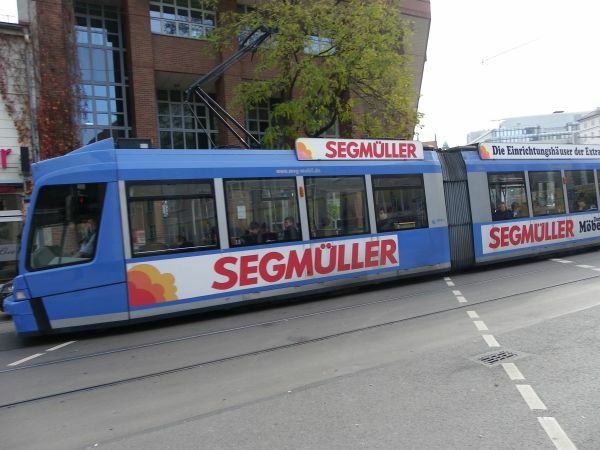 These are the only Augsburg trams with two cabs. Augsburg is already trying to get rid of these high-floor types. Some of them have been sold to Elblag in Poland and some others to Darmstadt. 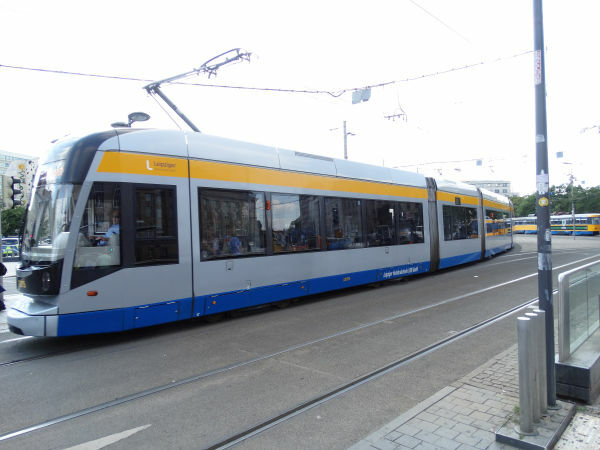 There were originally 12 of these trams and five were already sold 2012-13. Picture from Augsburg Hauptbahnhof 9.10.2015 by Ilkka Siissalo. Same M8c tram as above, seen from the other side. Inside view of an M8c tram. 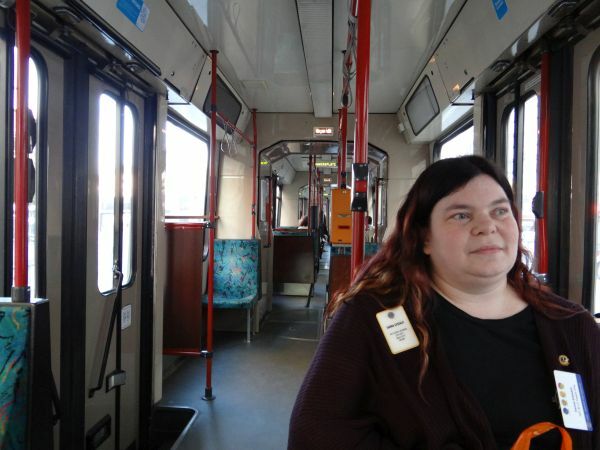 The lady in the picture is train photographer Sanna Siissalo. Picture from near Augsburg Hauptbahnhof 9.10.2015 by Ilkka Siissalo. 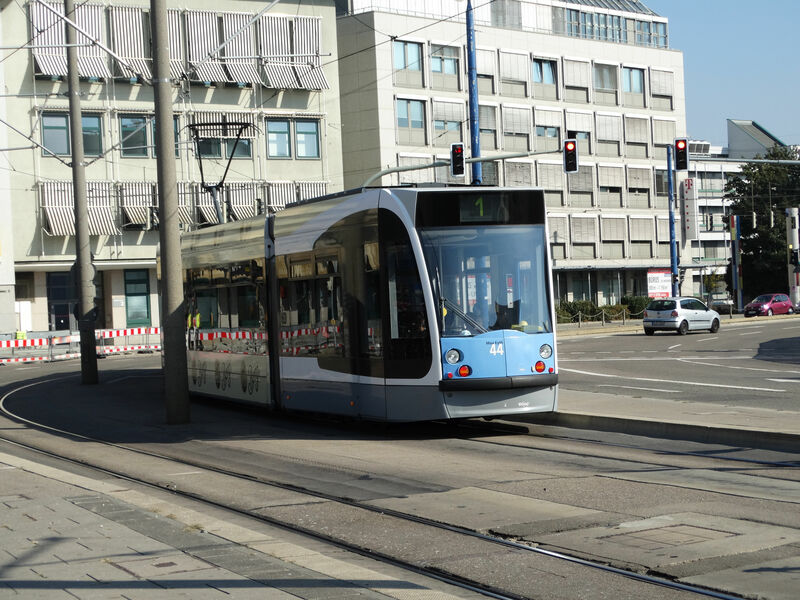 Augsburg tram 408. This is an old Rastatt GT4 from 1951, renovated/modernised in the 1970s. Photo by Erik Hjelme 23 September 1995. 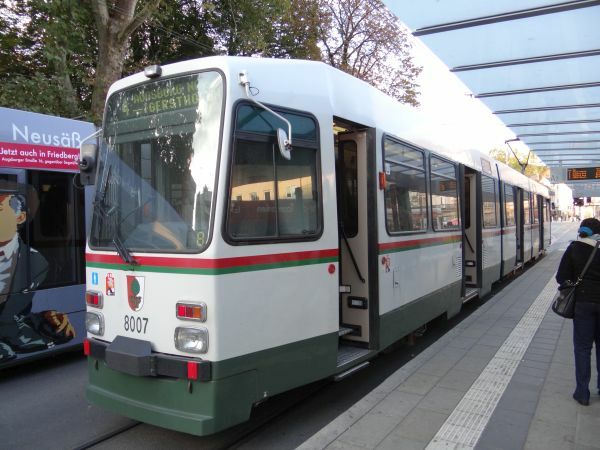 Augsburg tram 809. This is of the type MAN GT8. 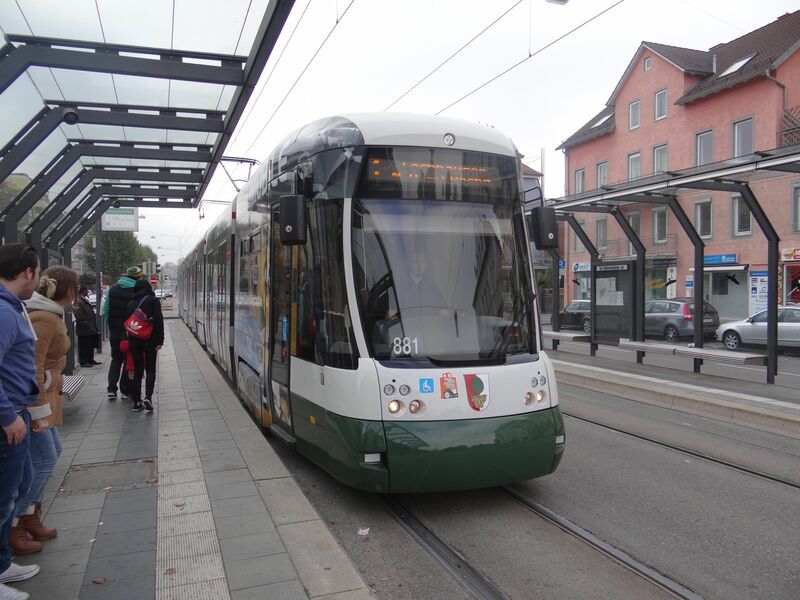 Augsburg tram no.826 is a Siemens Combino, here on the street Herrmannstrasse on line 1 to Göggingen. 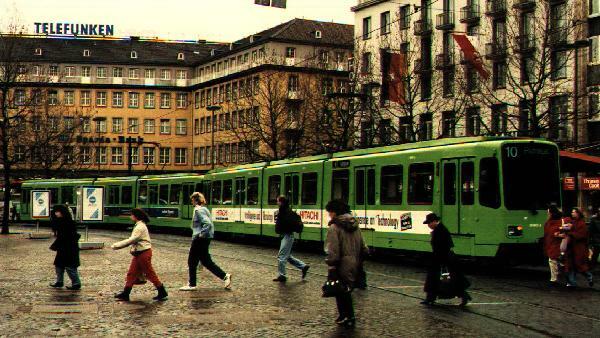 These Combinos were delivered to Augsburg 1999 to 2004 and there are 41 of them in use. Picture 9.10.2015 by Ilkka Siissalo. 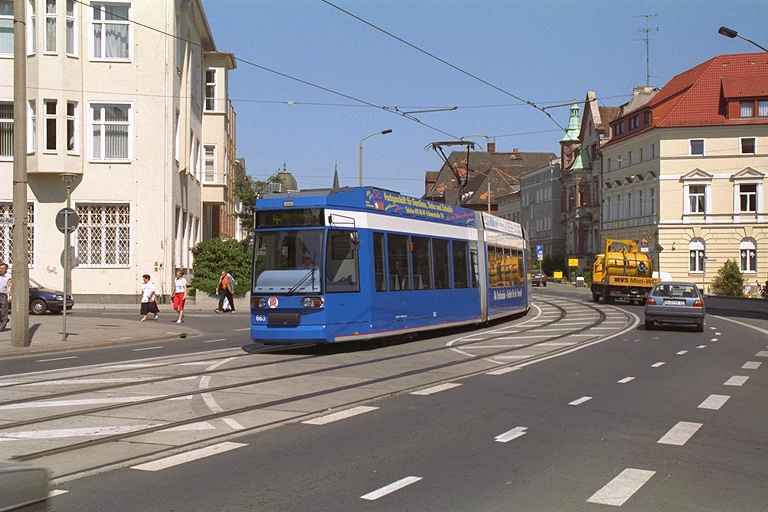 The same Augsburg tram no.826 at Herrmannstrasse on line 1 to Göggingen. 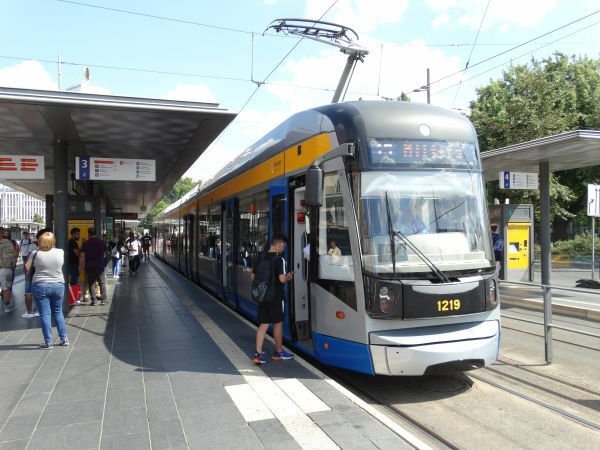 Same Siemens Combino as in the pictures above, but now at Königstor. This shows well the remarkable length fo the Combinos, up to 45 metres in this configuration. Even newer than the Siemens Combinos, this is a Bombardier CityFlex tram. Augsburg got 27 of them 2009-2011. The tram is extremely long. 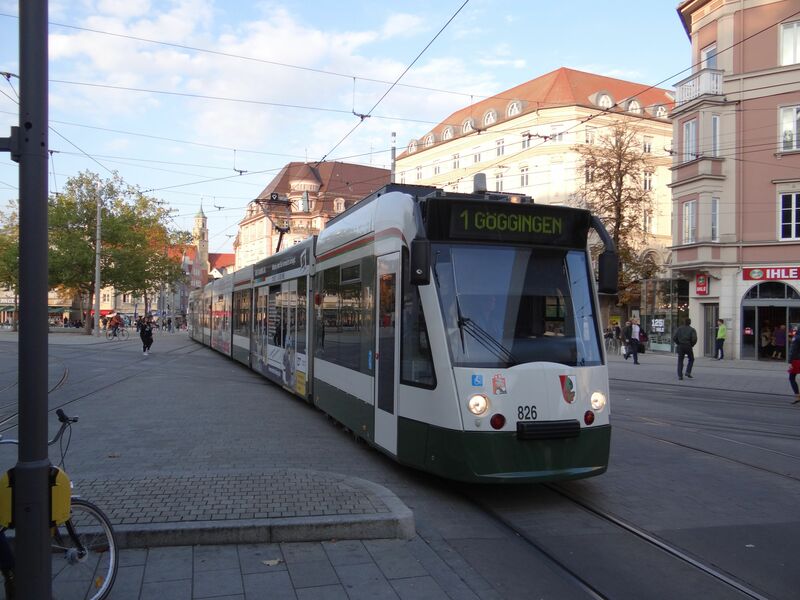 Picture from Göggingerstrasse in Augsburg 9.10.2015 by Ilkka Siissalo. Another one of the Bombardier CityFlex trams, the no.881 is here stopping at the tram stop Kongress am Park by the Göggingerstrasse. 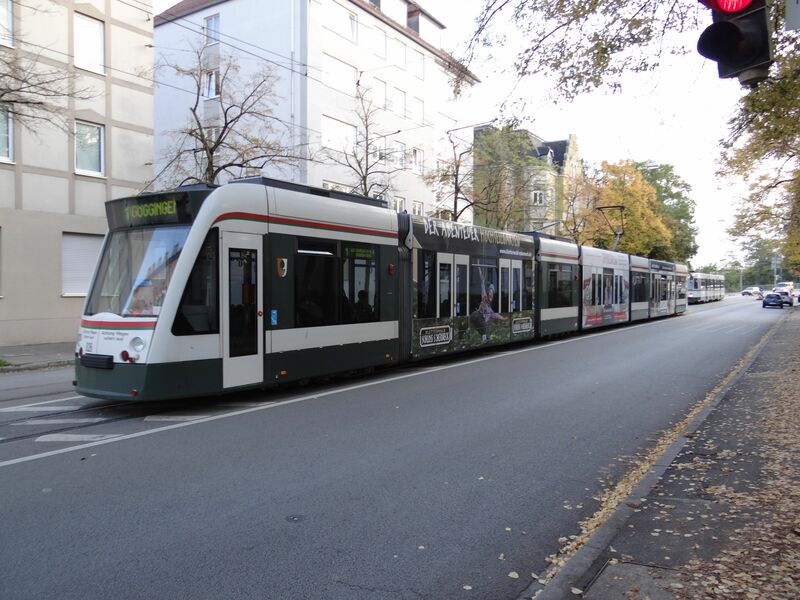 Picture from Göggingerstrasse in Augsburg 11.10.2015 by Ilkka Siissalo. 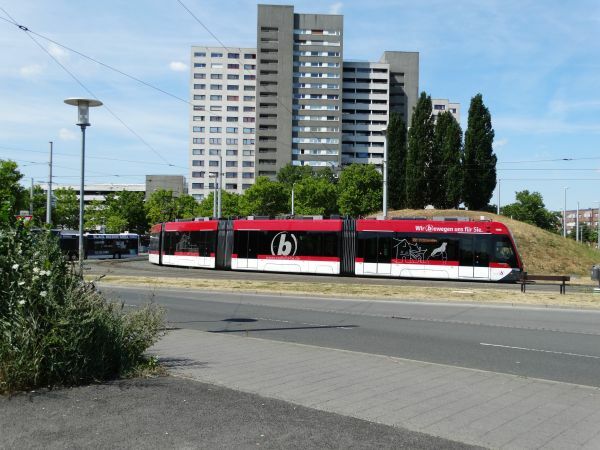 A new Solaris Tramino tram of the city of Braunschweig is turning in the loop in front of Braunschweig main station. 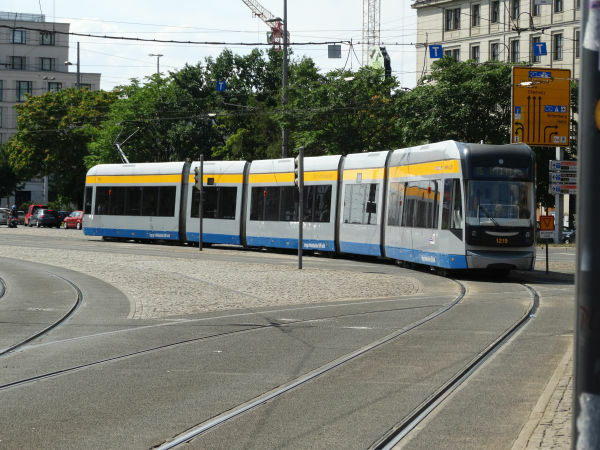 Dresden has today 14 tramlines and close to 200 trams. The network is operated by the Dresdner Verkehrsbetriebe, a part of the city itself. After the communist times the tram network was in a desolate condition and it is a wonder how nicely services have been restored by now. 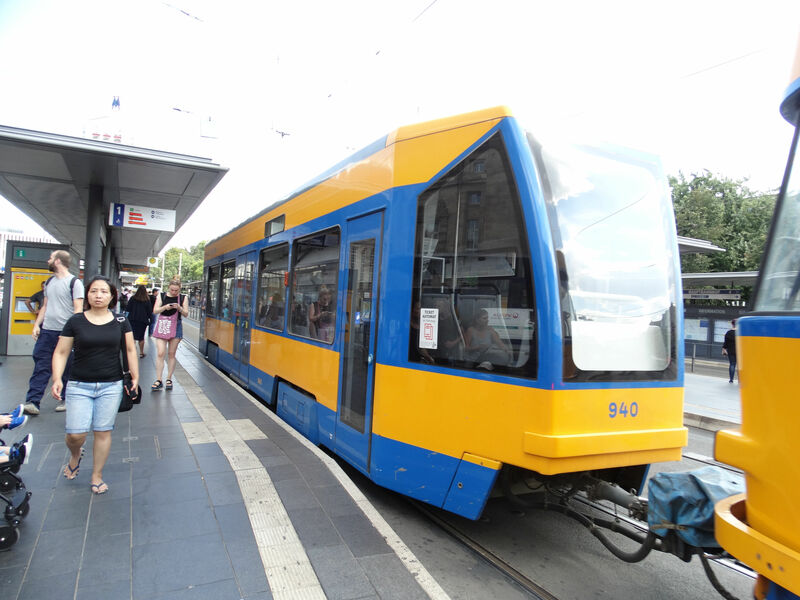 This tram no.2626 is a Bombardier Flexity Classic 8 axle version. There are also similar 12 axle variants. Picture from Dresden Washingtonstrasse 16.7.2018 by Ilkka Siissalo. The same tram 2626 seen from behind. 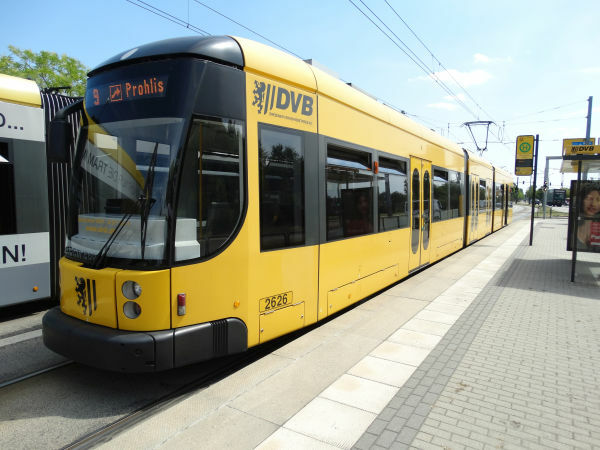 No.2607 is a similar Bombardier Flexity Classic 8 axle versionas depicted above, but it has tapings advertising DVB's own bus services. 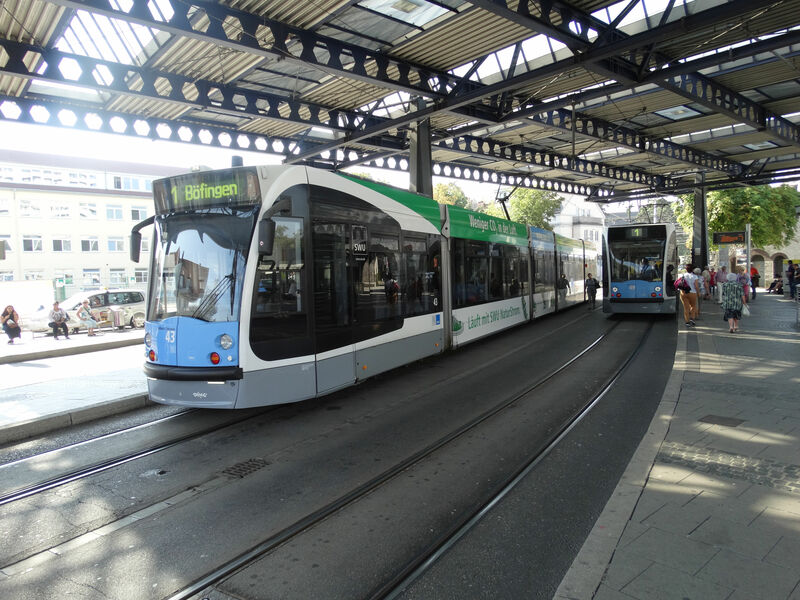 Class 6000 Hannover tram in front of main railway station. Photo in August 1996 by Ilkka Siissalo. Class 6000 Hannover trams run in the city center underground in a metro like fashion. While stopping at the high metro style platforms, they only open a part of their doors, thereby creating a level low-floor entry for passengers. While stopping at the street level stops, the trams can also open the lower part of their doors together with stairs. 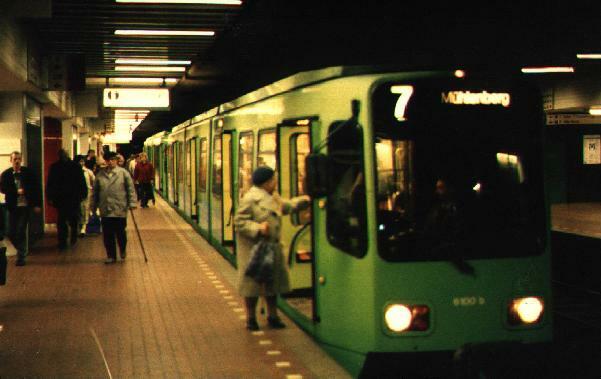 Photo from one of the metro-like underground stations in August 1996 by Ilkka Siissalo. 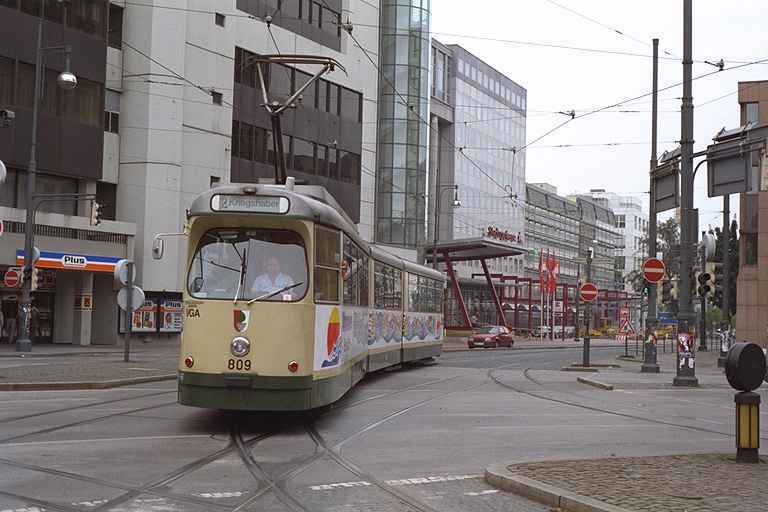 The classic tram of Leipzig, a Tatra T3 from communist times long gone by. 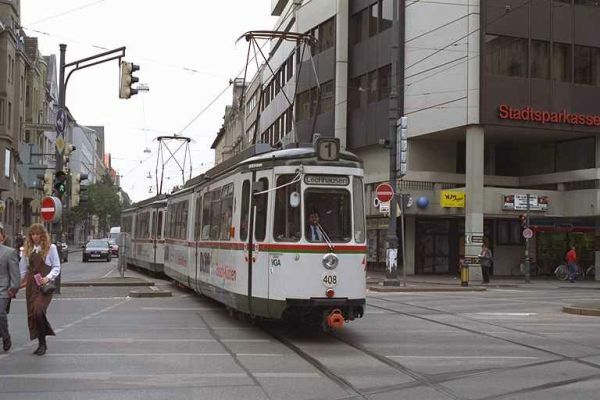 These trams were once abundant across all of the communist block countries of Europe, but nowadays an unmodernised Tatra T3 like here is a rarity - although this one has at some point of time received at least new lamps and a more modern line number and destination sign system. 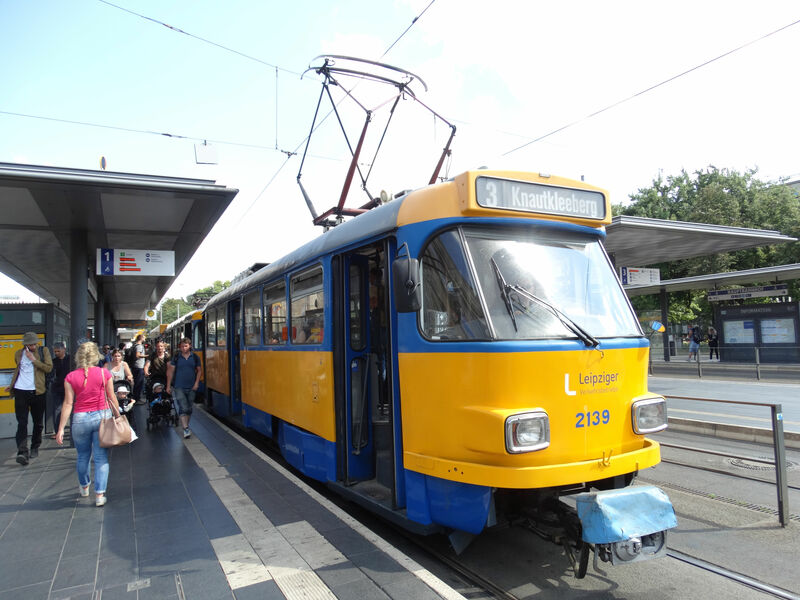 Tatra wagons are nowadays used in Leipzig mostly only at rush hours and mostly as three wagon trains as here. 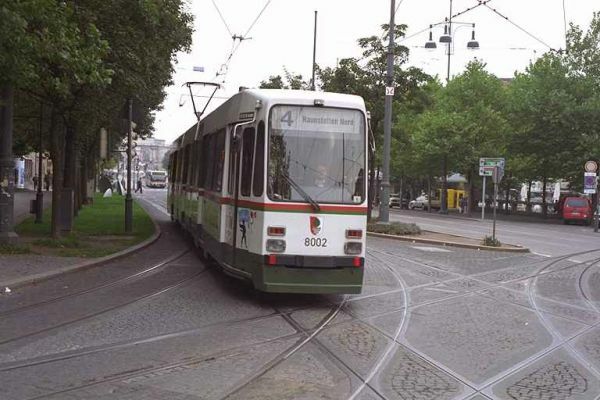 Notice how the second, similar Tatra T3 has its pantograph down as it is used merely as an addtonal unmotorised wagon. Picture from Leipzig Hauptbahnhof 16.7.2018 by Ilkka Siissalo. As mentioned above, old Tatra T3 trams are mostly used in Leipzig today as three wagon trains. Typically the last wagon is a new one with a low-floor section. 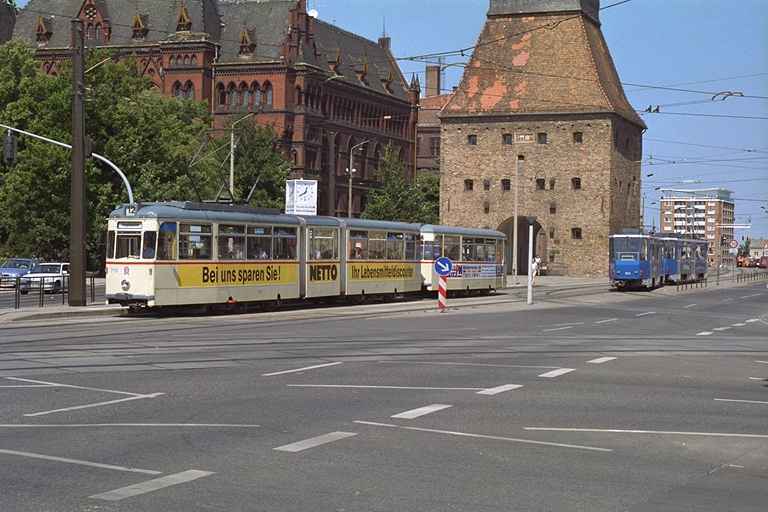 These low-floor new trailer coaches were first made for the city of Rostock, but as Rostock received more and more of new trams and could get rid of its communist-time Tatra wagons, they could sell some of the new trailers to Leipzig. This trailer wagon is a Bombardier 4NBWE built in 2013 for Rostock. 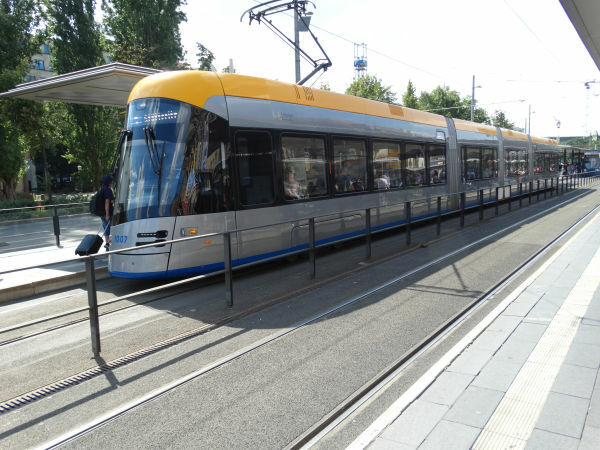 Some of the same modern Bombardier trailer coaches have already received the newer blue and grey livery of Leipziger Verkehrsbetriebe. Another "triplet" composed of two very old Tatra T3 trams and one modern Bombardier trailer. 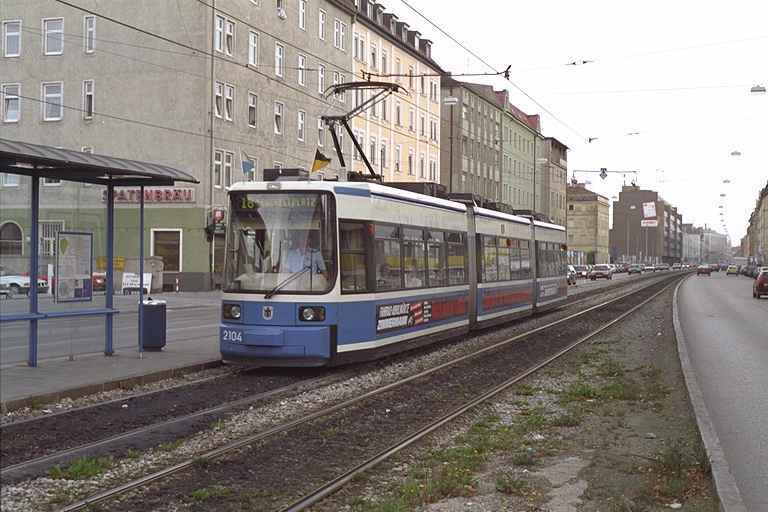 This long and modern tram no.1205 is a 12-axle Bombardier NGT12-LEI delivered in Leipzig in October 2005. No.1219 is a similar 12-axle Bombardier NGT12-LEI as shown above. This one was delivered in February 2007. 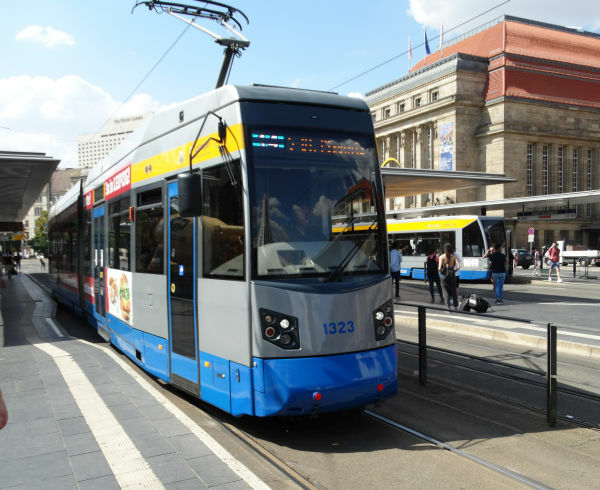 The same tram 1219 as shown above, but here stopping at the Leipzig main station tram stop. 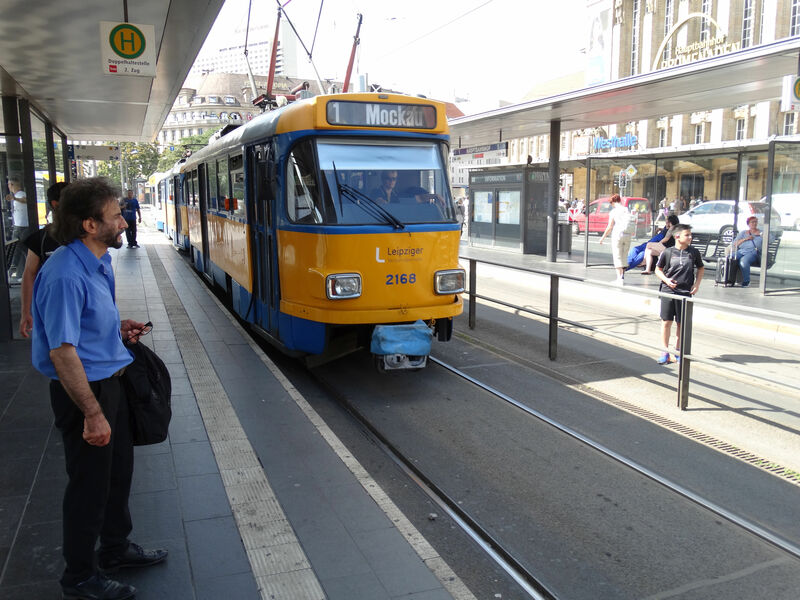 The NGT12-LEI is a remarkably long tram. It's 45 metres long. Tram 1146 is of the type NGT8. 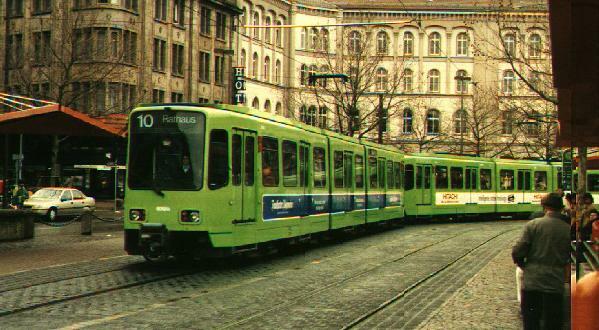 It was Leipzig's first modern low-floor tram type. 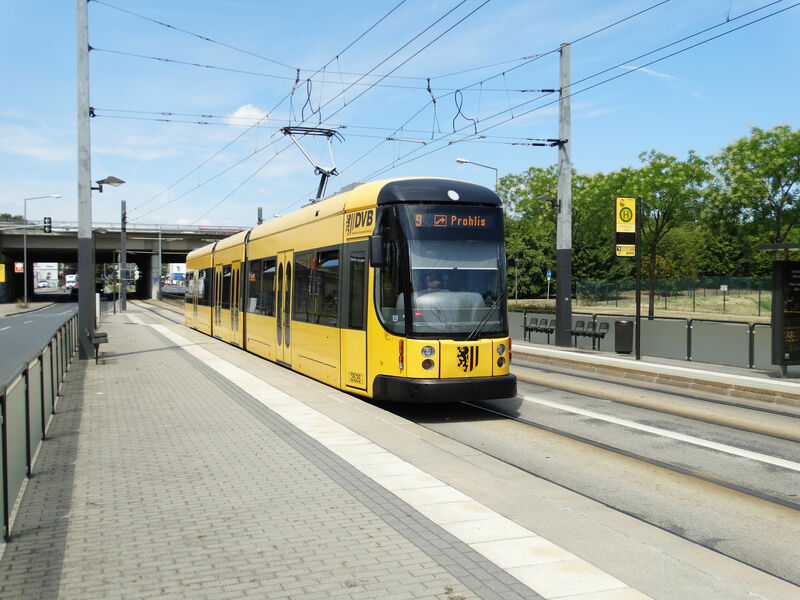 They were built bu Düwag, Waggonbau Bautzen, ABB and Siemens. There are 56 of them and they were delivered 1994 to 1998. 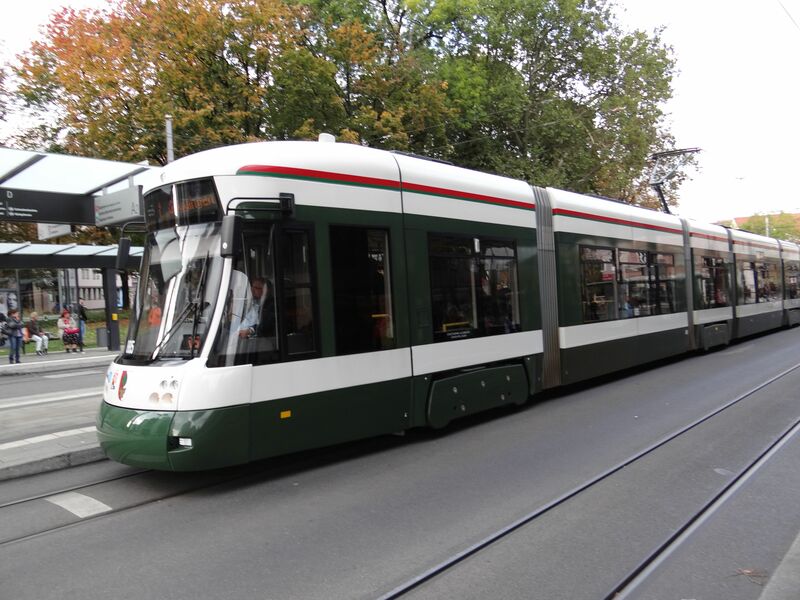 In 2003-04 there were still not enough modern trams in Leipzig and there was not enough money to buy a large series of some of the most common Western German types, so the Leipzigers started making their own new trams. The model became known as the Leoliner or NGTW6L. They were built by the company LEOLINER Fahrzeug-Bau Leipzig GmbH. Two prototypes appeared on the streets of Leipzig in 2004 and from December 2005 to 2009 a total of 50 Leoliners were taken in use. 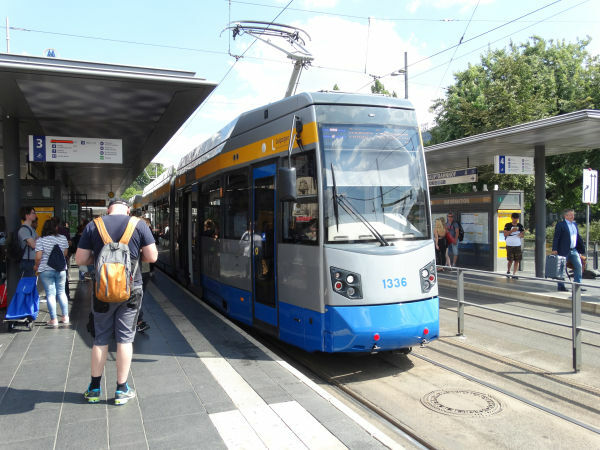 They were not very good trams, there were a lot of troubles with them, but they are still in 2018 in use on lines 3, 7, 11 and 14, on all other lines as a coupled pair, but on line 14 normally solo. This is a solo Leoliner on line 14. A pair of Leoliners on line 7. 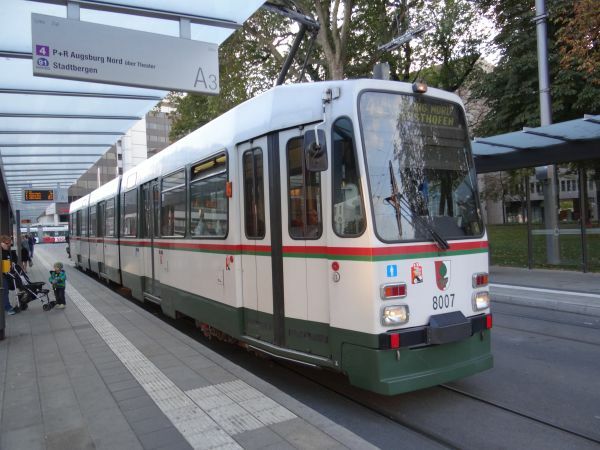 This tram no.1007 is one of Leipzig's most modern trams. It was built by the company Solaris in what formerly was the German city of Breslau, but what today is Wroclaw, part of Poland. It is of the type NGT10-XL and this is still one of the prototypes, the first of which were delivered in 2016. It's 38 meters long and can take 220 passengers. München tram 2009. This is a class P tram built by Rathgeber 1967-69. A two car set can take 315 passengers. 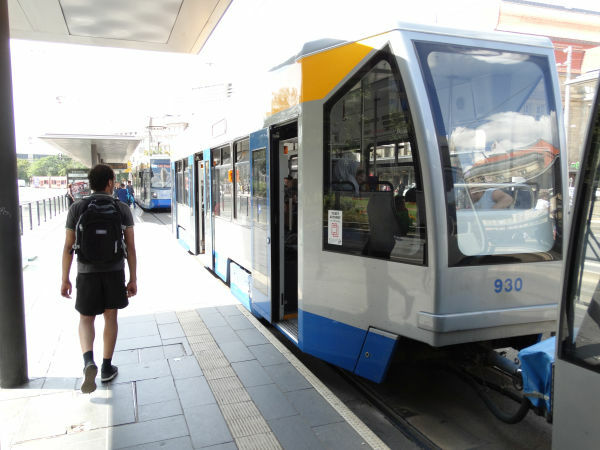 Most of the class P trams have been taken out of service by now. München tram 2104 of a newer lowfloor type. 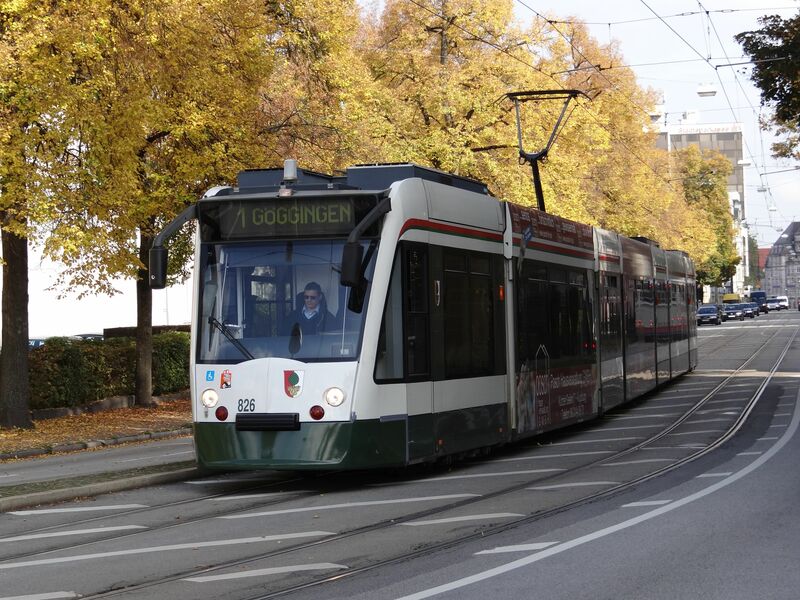 This is an ADtranz tram of the type GT6N, known in München as the type R2. It has space for 157 passengers, of which 58 have a seat. 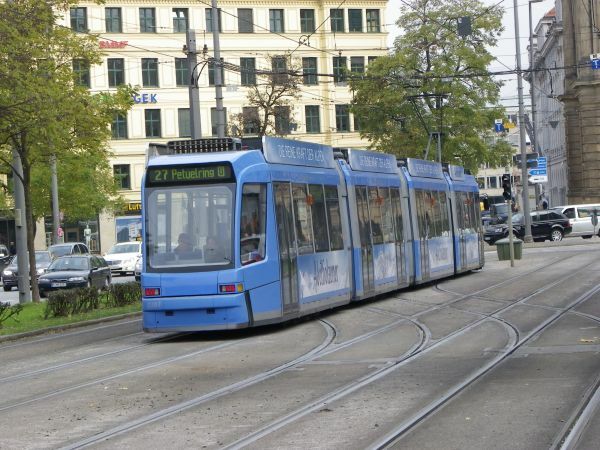 München tram 2207 is an Adtranz GT8N2 from the year 2000. Photo by Ilkka Siissalo 16.11.2012. Front part of a similar Adtranz GT8N2 from the year 2000. This is a type specifically designed for München. It's a four part tram with 8 axles. MVG has 20 of them. Rostock tram 715. 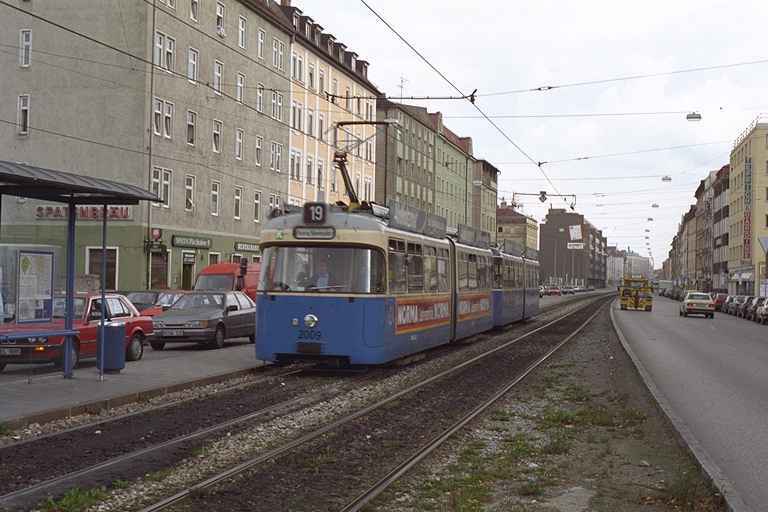 This old ex-DDR type is nicknamed "two rooms and a kitchen", Here the tram is coupled to an additional trailer. Photo by Erik Hjelme 27 july 1995. 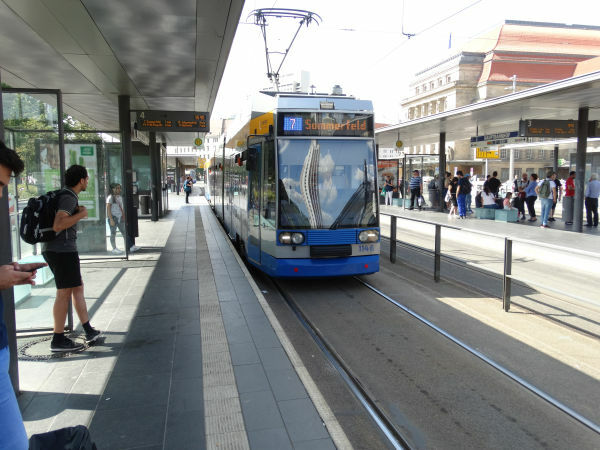 The city of Ulm has currently only two tram lines and actually they also are just end to end, one long line. There was earlier a plan for five lines, but a local voting turned it down. All the trams are Siemens Combinos or the newer Siemens Avenios. Avenio is the successor model built based on the Combino. 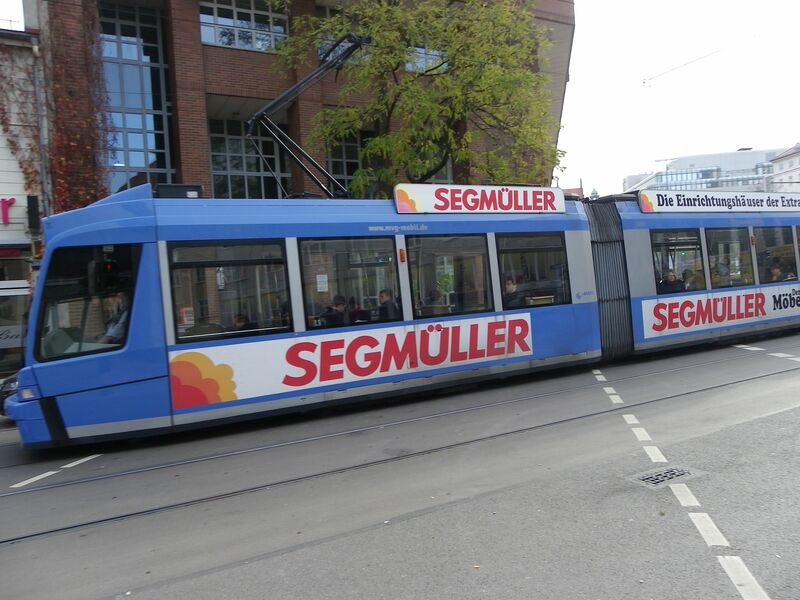 This tram no. 44 is one of the Combinos, here on line 1, just leaving the main station. Picture from Ulm Hauptbahnhof (main station) 14.9.2016 by Ilkka Siissalo. Two Combinos, numbers 43 and 49 stopping on line 1 at the main station. 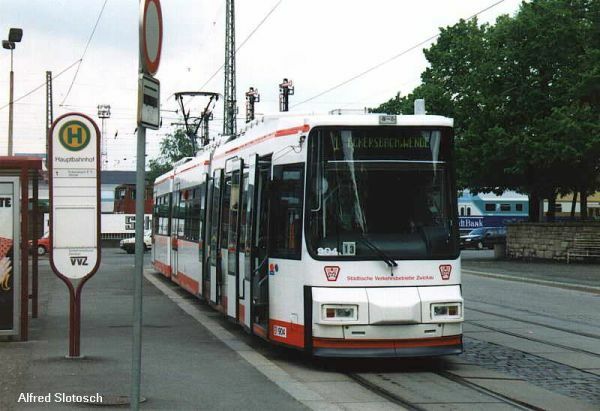 Zwickauer tram no.904 is of the type MAN GT6M from 1993. Photo by Alfred Slotosch in 1995.